Second Row: Ayun Halliday, David Carl, Arthur Aulisi, Polly Lee, Milo Kotis, and Kiet Tai Cao. Many people think they know the truth about Santa, but they are wrong. Ho ho ho, children! Santa has some shocking unadvertised powers, a couple of half-mortal offspring his wife hasn’t found out about yet, and a lot on his mind. He’s tired of those damn singing elves. He’s tired of the lies. This is the Christmas Santa will reveal his true self. 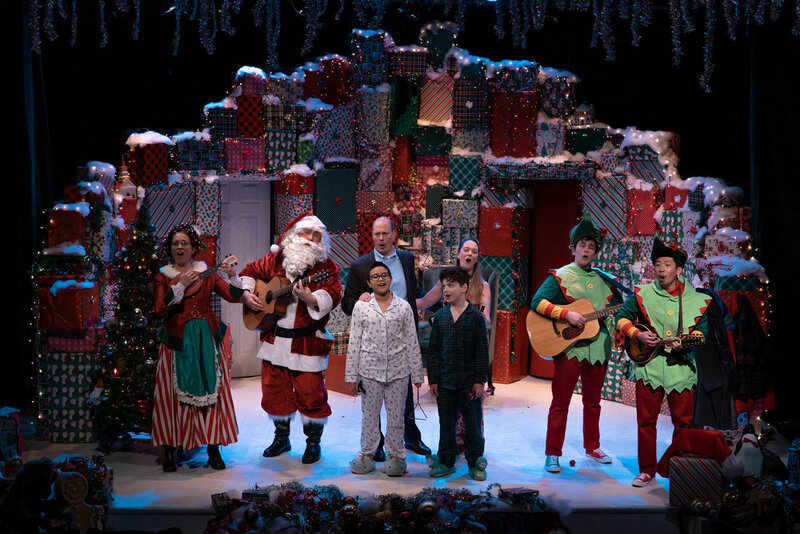 Prepare for the Ragnarök, urm, SANTA CLAUS' RETURN TO OFF-OFF-BROADWAY. Presented by Theater of the Apes and The Tank. Click here to read the review on theatrescene.net. *Equity member appearing with permission of Actors’ Equity Association without benefit of an Equity contract in this Off-Off Broadway production. THE TRUTH ABOUT SANTA was an AEA approved showcase production. Greg Kotis (Playwright) is the author of many plays and musicals including Urinetown (Book/Lyrics), The Sting (Lyrics), Lunchtime, Give the People What They Want, Michael von Siebenburg Melts Through the Floorboards, Yeast Nation (Book/Lyrics), Pig Farm, Eat the Taste, and Jobey and Katherine. Future projects include ZM, an original musical about teenaged fast-food workers trying to survive a zombie plague. Greg co-founded Theater of The Apes with his wife Ayun Halliday, and is a member of the Neo-Futurists, the Cardiff Giant Theater Company, ASCAP, and the Dramatists Guild. He grew up in Wellfleet, Massachusetts, where he celebrated Christmas with his secular Jewish family, and now lives in New York City where he waits each year for Santa’s return.